Love is best expressed by sending this gift of Everlasting Roses Bouquet with Fresh Cake to your near and dear ones. This gorgeous Bouquet is loaded with 6 Red Roses and comes with Chocolate Cake 1 Lb. Engage in the true spirit of celebration with this Expressive 6 Red Roses Bouquet with Chocolate Cake 2.2 Lb. that instantly uplifts the mood. 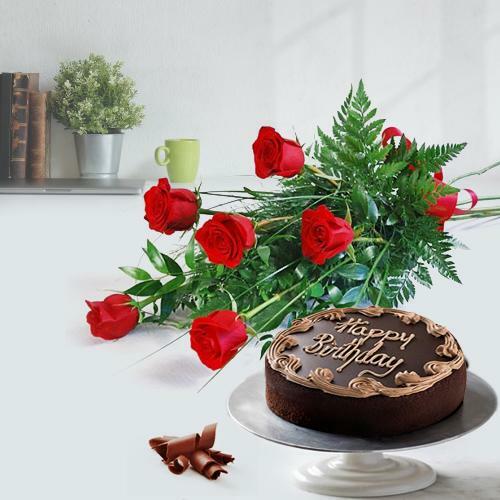 Engage in the true spirit of celebration with this Expressive 6 Red Roses Bouquet with Chocolate Cake 4.4 Lb. that instantly uplifts the mood.